Note-Up is another potentially unwanted application that might start acting in a way that you will not like. It is developed by QUAHOG LIMITED, and it is promoted on its official website note-up.com. If we take into account ONLY the information available on its website, we could say that this application is a useful event planner and reminder. Unfortunately, this is not exactly true. Researchers working at pcthreat.com have tested Note-Up very thoroughly and are sure that it is not as beneficial as it claims to be on its official website. We suggest reading through this article in order to find out how Note-Up really acts. If you still want to keep it installed after reading this article, we will not force you to get rid of it; however, if it happens that you wish to remove it ASAP, you should use our manual removal instructions which are provided below this article or employ an automatic method which is described in a detailed way in the last paragraph of the article. First of all, users who download and install Note-Up on their systems notice that it is not a very beneficial program. In fact, it does not even act as it should, for example, if you enter an email address in order to get a reminder, you will most probably not receive any email. On top of that, specialists say that users might not even understand that they see a reminder because only a pop-up window will appear on their screens. Of course, we do not call Note-Up a potentially unwanted program just because of that. Researchers working at pcthreat.com have managed to find out that this software created a Value with a name Not-up in HKLM\SOFTWARE\Microsoft\Windows\CurrentVersion\Run. Of course, nobody will ask your permission whether or not this program can start together with Windows and work in the background all the time. Specialists who have tested this application also say that it might download other unreliable programs, including adware, potentially unwanted programs, and browser hijackers on the system. Unfortunately, you will not even know about that and will understand that something is wrong only when these threats start acting in an undesirable way. Note-Up can be easily downloaded from its official website note-up.com; however, you can get it from other sources too, for example, it is possible to download it from some kind of third-party web page or it might sneak onto your computer without permission in a bundle with other untrustworthy applications. To protect your computer from future harm, you should install a security tool, and we highly recommend that you install those programs which you know are fully reliable only. It is possible to remove Note-Up from the system via Control Panel. Unfortunately, it might be slightly more difficult to eliminate applications that have entered your system together with it. Luckily, you can remove Note-Up and other existing infections automatically too. In order to do that, you simply have to acquire a security application and scan your system with it. We recommend using SpyHunter for this matter. Right-click on Note-Up and click Uninstall. Tap the Windows key + R simultaneously to launch RUN. 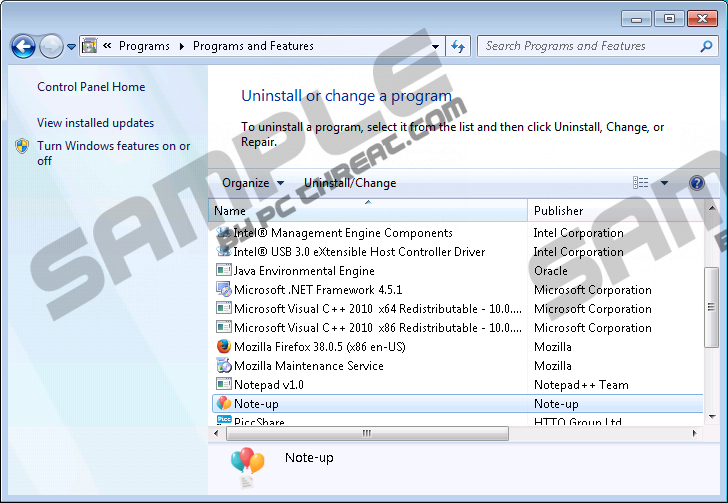 Select the program you wish to remove and then click Uninstall. Quick & tested solution for Note-Up removal.